There is mounting evidence that students who don’t feel safe don’t learn. Thanks to the always-on nature of the internet, bullying and other risks follow students beyond the school day. 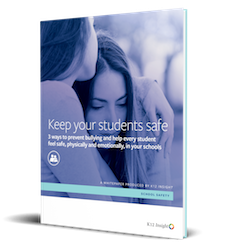 Safety isn’t just another thing to do–as school leaders, it needs to be a part of everything you do. Fill out this short form to download your copy. © 2018 K12 Insight. All rights reserved.